In large bowl, beat eggs and milk with fork or wire whisk. Set aside. In 12-inch nonstick skillet, melt butter over medium heat. Add Canadian bacon and spinach; cook and stir 1 minute, just until spinach begins to wilt. Pour egg mixture over spinach mixture; add cheese. Cook 3 to 5 minutes, stirring occasionally, until eggs are set but slightly moist. Spoon 1/2 cup egg mixture onto each muffin half. For the best flavor, Brie should be very ripe. Select a round of Brie that is plump; the rind might have some pale edges. Use Brie within a few days, as it does not keep well. 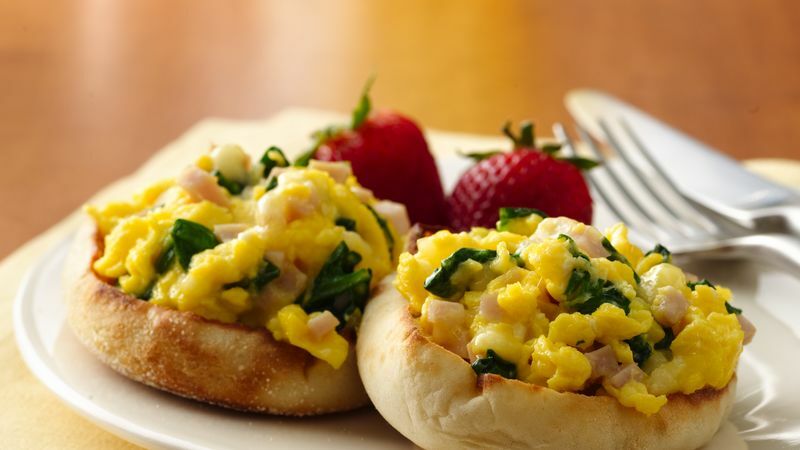 This upscale egg dish is great for brunch, paired with your favorite fresh fruits.